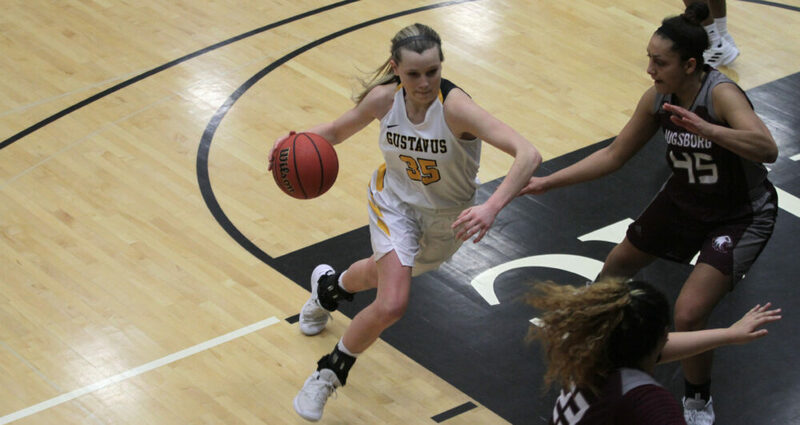 SAINT PETER, Minn. – The Gustavus women’s basketball team Wednesday lost 77-68 to Augsburg, dropping to 12-10 overall and 9-6 in the MIAC. The Gusties shot well at 50 percent, but committed 20 turnovers and sent the Auggies to the free throw line 25 times where they made 20. The first half was a back and forth battle with seven lead changes, resulting in a 17-17 score after the first quarter and 29-29 score at halftime. The third quarter proved to be the difference in the game as the Auggies erased a four-point deficit with a 13-2 run and ended the quarter with a 55-48 advantage. The Gusties got the score down to a five-point difference (59-54) with 5:30 remaining in the game, but Augsburg ensued with eight unanswered points and held on to the lead the rest of the way. Gustavus shot 26-of-52 from the field, but made just 3-of-10 three-pointers. Conversely, the Auggies made 7-of-18 from beyond the arc and outscored the home team 20-13 off turnovers. Kendall Thompson (Sr., Eden Praire, Minn.) scored a career-high 27 points, shooting 10-for-16 from the field and 6-for-6 from the free throw line. She also posted five rebounds, five steals, and four assists. Justine Lee (Sr., Dawson, Minn.) contributed 13 points, four rebounds, and two assists. Paige Richert (So., Comfrey, Minn.) added 10 points and eight rebounds. Gustavus returns to Gus Young Court 1 p.m. Saturday for its final regular season home game against St. Catherine.